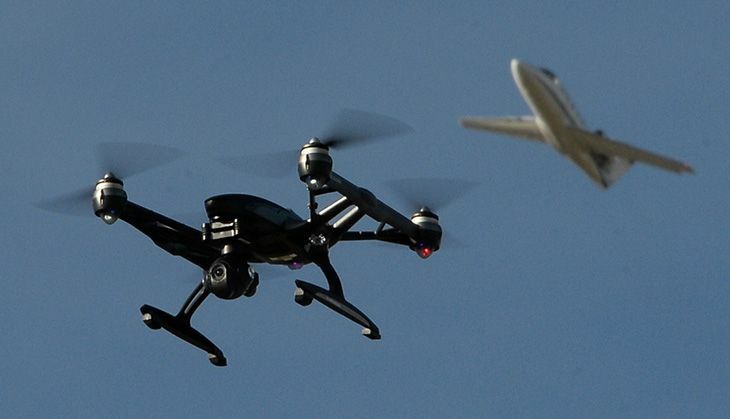 Home » Science & Technology » Are drones really dangerous to airplanes? Imagine boarding a plane. Economy class. There's a kid behind you kicking the seat. You put on headphones and try to tune out the world. Immediately after takeoff, you feel a thud and hear an explosion over the sound of your music. The plane lurches. You look out the window at the plane's engine and see fire and black smoke. Terrifying, right? That's the fear that animates the Federal Aviation Administration's hostile approach to drone regulation. The agency, required by Congress to finalize permanent regulations of commercial drones under section 332 of the FAA Modernization and Reform Act by September 2015, has missed that deadline. So far, the agency's only efforts appear to be issuing rules under a more restrictive part of that law, section 333, intended to be in effect temporarily - until the FAA finished the final ones. And it has imposed a requirement that people register noncommercial "model aircraft," a move criticized as onerous, and currently facing a court challenge. But drones don't pose much of a risk to traditional aviation. Though there is always a risk when you board a plane that an object will be ingested into an engine, our research shows that the problem is far more likely to be a bird than a drone. There are on the order of 10 billion birds in U.S. airspace. Although efforts are made to keep them away from airports, where they pose the biggest threat, pilots, airlines, airports and others voluntarily reported 13,414 bird-aircraft collisions on the FAA's dedicated wildlife strike website in 2014, split about equally between passenger jets and other aircraft including helicopters and small planes. Rarely, these collisions are serious enough to take out a jet engine. In 2014, birds were reported ingested into engines only 417 times, and only 112 of those reports indicated any damage to the aircraft. My colleague Sam Hammond and I extrapolate from wildlife strike data to estimate the danger that drones pose to manned aircraft and the people aboard them. We estimated how often drones will strike manned planes by assuming that drones are roughly equivalent to birds - that they are of similar size, and that drone operators are at least as able to avoid aircraft as birds are. So drones are safe if their operators have at least as much cognitive capacity as birds. It's true that the dumbest humans may deliberately fly drones in the path of airliners. Enforcing prohibitions on this is difficult. To keep airspace safe, the FAA needs a two-pronged strategy of operator education and technological solutions to manage a more crowded airspace. The FAA also launched a dedicated smartphone app, B4UFLY, that uses the phone's geolocation feature to inform the user of the restrictions on and requirements for flying a drone in the area. The agency should prioritize giving operators accurate information about where they can and can't fly, and it should provide users with a quality app experience so that they actually consult the app. The private sector has joined the effort. One such service compiling this type of information is AirMap, with a mobile-optimized website hobbyists can use to determine where they are not supposed to fly. In addition to education, the agency should focus on short-run and long-run technological solutions to the problem of an increasingly crowded airspace. In the short run, a technology called "geofencing" is promising and has already been adopted by drone manufacturers such as DJI and 3D Robotics: drones are equipped with GPS and know to keep themselves out of places it is illegal for the drone to fly, such as near airports; in the Washington, D.C., area; in national parks; or near crowded stadiums. In the longer run, the FAA should focus on modernizing airspace for the likelihood that even manned aviation will benefit from the technologies currently developing in the unmanned sector. While most "drones" are currently remote-controlled, the ultimate vision is that they will be autonomously piloted and communicate with each other to avoid collisions. To increase the safety of unmanned and manned aviation, as well as of the mixture of the two, the FAA should accelerate its plans to incorporate this new model of airspace management into the system. Engineering and field testing done by NASA is a great first step, but airspace modernization should be a central theme in the FAA's approach to drone integration. As our wildlife strike study shows, drones themselves aren't the real threat. If the FAA wants to make American airspace safer and more conducive to innovation, it should leverage education and technology instead of outright prohibitions and unenforceable registration requirements.